She has betrayed him. He is facing a Court Martial. Can they love each other again? Kaisa knows she’s to blame. It’s her fault the relationship with the handsome Englishman, Navy Officer Peter, has ended. What can she do but move back to her native Finland? But sleeping on her sister’s sofa bed thousands of miles away from her beloved Peter won’t bring him back, so when Kaisa is offered a job in London she jumps at the chance. Peter is not sorry. He’s angry. Angry at everything and everybody. He’s about to lose the one thing that means most to him: his Navy career. All because he was stupid enough to fall in love. A chance meeting at a rooftop party in London sees the two ex-lovers steal a passionate kiss. But Peter has a new girlfriend and Kaisa’s career in journalism is finally taking off. Is it too late, or can Peter and Kaisa love each other again? 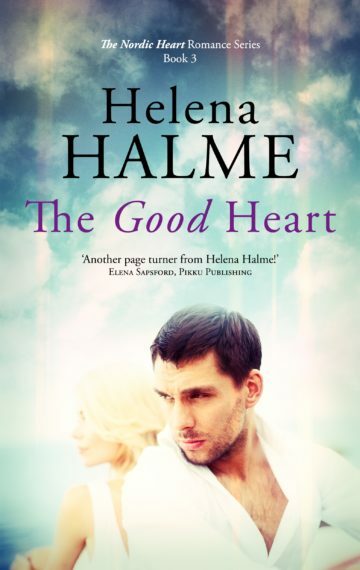 A standalone read, The Good Heart is the third novel in The Nordic Heart Series, which follows the tumultuous 1980s love affair between the Finnish-born Kaisa and a British Navy Officer, Peter. If you like Nordic fiction or a page-turning military love story, then you’ll adore this gem of a novel by the Finnish author Helena Halme. Pick up The Good Heart to discover this touching Finnish and British fiction series today! Another page turner from Helena Halme! The relationship of the protagonists continues along its rocky path, and you just have to find out what happens next….Will they be a couple by the end? – Elena Sapsford, founder and Director, Pikku Publishing. The Good Heart is available to buy from good bookshops and on Amazon. The Good Heart was previously published as The Good Officer.